After giving the Hitler salute Russian Neo-Nazis have time to Visit Yad Vashem! Comment is superflous regarding this story from Richard Silverstein’s blog. Two far-right members of the Knesset – Aryeh Eldad of the National Union (formerly National Religious Party) and Ayoob Kara of Likud welcome Russian neo-Nazis to Israel. They go on a tour of Yad Vashem, the Zionists’ Holocaust Memorial Propaganda Institute/Museum, give Hitler salutes and of course don’t believe in the holocaust but thoroughly agree with Israel on murdering and dispossessing Palestinians. And because Israel main enemy are the indigenous people of Palestine, most of whom are Muslim, not white neo-Nazis, most of whom support Israel today, then Zionism today, from Jonathan Hoffman with his dalliances with the EDL to Eldad are happy to hold hands with those who were and are the bitterest enemies of Jews. After all, if you a racist you can hardly object to other peoples’ racism. Below is a story from Newsweek concerning another visit of Neo-Nazis to Yad Vashem to pay their respect to those that their political mentors murdered. Perhaps Yad Vashem should think of setting up a special visitors’ room, complete with Swastikas, for their increasingly regular guests from the far right? When an Israeli reader sent this story to me I couldn't believe the headline summarized above. Further, in this day and age of Norwegian neo-Nazi, anti-jihadi attacks which wrap themselves in the Israeli flag, this story is simply mind-blowing. 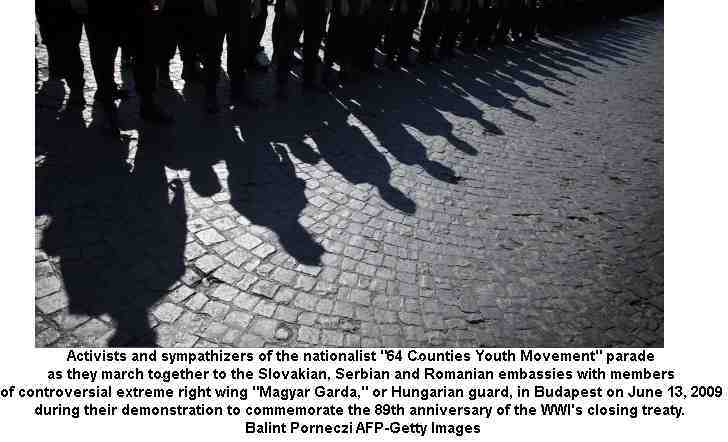 Russian neo-Nazis parade displaying Hitler salute before their settler-organized visit to Knesset and Yad VaShem. It begins with a visit from a Russian neo-Nazi delegation to Israel. Under the auspices of Tuvia Lerner, editor of the Russian edition of Arutz 7, the media voice of the settler movement, they inveigled themselves an invitation to meet with far-right MKs Aryeh Eldad and Ayoob Kara. They also toured Yad VaShem without telling anyone there that they were Holocaust deniers. Like I told you, this story has to be read to be believed. The two Russians have been photographed giving Nazi salutes, celebrating Der Fuhrer's birthday, and they published songs of praise to Adoph Hitler on their website. "We're talking about radical Islam which is the enemy of humanity, enemy of democracy, enemy of progress and of any sane society." With friends like this does Israel need enemies? Does it wish to lie down with dogs who kill Chechens and Africans for sport only to rise up with fleas? Who assassinate human rights activists and lawyers? Who dream of a master race following its destiny? Is Israel so desperate that it needs such friends in order to battle the common Muslim enemy? Have we not learned a single thing from Anders Breivik? Lerner attempts to defend his efforts to ingratiate the Russian fascist movement into the good graces of Israeli society by claiming that the two neo-Nazis told him they regretted the anti-Semitic statements they'd made fifteen years ago. But can the leopard changes its spots?? The reporter notes that in just the past year the group wrote that the Holocaust was "a myth." Then he asks whether the apology was sincere and whether such figures belonged in a place in which the elected representatives of the nation gathered. The report also features an interview with Eldad in which he feigns an intelligence he clearly lacks, when he says that he knew from the outset that something "didn't smell right." And that he met them for only a few minutes (when the TV screen fills with images of him shaking hands and laughing jovially with the Russian delegation). Anyone reading this blog knows my views about settler extremists, but how can Israel countenance such shocking, disgraceful acts from Arutz 7 and these disgusting representatives of the Israeli people elected to the Knesset? Is anyone using their brains there? Or has everyone lost their senses? Regaling neo-Nazis with anti-jihadi jokes in the halls of the Knesset? Defiling Yad VaShem with unreconstructed Holocaust deniers? Please someone explain this to me (if you can). But these were no ordinary travelers with Zionist sympathies. Rather, on this trip to Israel were a Belgian politician known for his contacts with SS veterans, an Austrian with neo-Nazi ties, and a Swede whose political party has deep roots in Swedish fascism—unlikely visitors to pay their respects at Yad Vashem, perhaps, unless one considers the political currents in Israel and Europe, and the adage that one’s enemy’s enemy is one’s friend. Only a few years ago, many of Europe’s far-right politicians were openly anti-Semitic. Now some of the same populist parties are embracing Israel to unite against what they perceive to be a common threat. Over the past few years, Europe’s right-wing political leaders have tapped into rising worries over immigration from Islamic countries to predominantly secular and Christian Europe, where the number of Muslims has grown from 29.6 million in 1990 to 44.1 million in 2010, or up to 10 percent of the population in countries such as France. Geert Wilders, an anti-Islam firebrand whose Party for Freedom last July gained a record 24 seats in the Netherlands’ Parliament, likens the Quran to Hitler’s Mein Kampf and has called Muhammad a “devil” spreading a “fascist ideology,” and has vowed to stop Muslim immigration. In Switzerland, 57 percent of voters banned the construction of minarets in a popular referendum in late 2009. In poll after poll, large majorities of Europeans say they worry about the spread of Islam and that Muslims have not properly integrated. Invited by a right-wing Israeli businessman named Chaim Muehlstein, the December visitors did not compose an official delegation. “Jesus Christ,” fumed a government spokesman anonymously when asked about the visit; Yad Vashem spokeswoman Estee Yaari cringed when NEWSWEEK asked her about the group. “Millions come here every year, and I definitely didn’t meet these people,” she said. But members of the Knesset did meet with the group, which signed a “Jerusalem Declaration” guaranteeing Israel’s right to defend itself against terror. “We stand at the vanguard in the fight for the Western, democratic community” against the “totalitarian threat” of “fundamentalist Islam,” says the document, which was signed by members of the group that included Heinz-Christian Strache, head of the Austrian Freedom Party; Filip Dewinter, head of Belgium’s ultranationalist Vlaams Belang; René Stadtkewitz, founder of the German Freedom Party; and Kent Ekeroth, the international secretary for the Sweden Democrats, a populist anti-immigration party. During their trip, the Europeans drove through Palestinian villages in a bulletproof bus to meet Jewish settlers in the desolate West Bank outpost of Har Bracha, set on a windswept mountain bluff with views into Jordan. While there, they vowed that the settlements were necessary to defend Israel against its Arab enemies. That some of the signatories to the Jerusalem Declaration have histories of extremism doesn’t bother Nissim Zeev, a member of the Knesset who met with the visiting Europeans. “At the end of the day, what’s important is their attitude—the fact they really love Israel,” says Zeev, who represents Shas, an Orthodox right-wing party. For the European politicians, this is a useful alliance, too: many find that support for Israel dovetails nicely with an anti-Islam platform. While anti-Muslim sentiments are wide-spread (more than 50 percent of Germans recently polled said they could imagine voting for an anti-Islamic party), anti-Semitism is no longer considered an acceptable part of political discourse, says Cas Mudde, an expert on European populism at DePauw University. In an interview before his death in a 2008 car crash, Jörg Haider, the longtime leader of the Austrian Freedom Party and Strache’s predecessor, talked of Strache’s plans to use Israel to make the party more respectable. “If the Jews accept us, then we won’t have a problem,” Haider said Strache told him. Today, polls show support for Strache at a record 25 percent. Among Austrians under 30, the Freedom Party polls 42 percent. The growing antipathy toward Muslims in Europe is spurred on by organizations such as Stop the Islamization of Europe, which has chapters in 11 countries, and the English Defence League, a growing protest movement that regularly sends hundreds of rampaging demonstrators into Muslim neighborhoods in British cities. These and countless other, smaller groups regularly protest mosque construction and Sharia, the Quranic code that some European Muslim communities have tried to enforce. On the Web, one of the anti-Islam movement’s countless outposts is called Reconquista Europe, named after the centuries-long struggle to drive Islam out of Spain that ended with the mass expulsion of Muslims and Jews in 1492. Strache, too, likes to play on history. In campaign literature, he is depicted in knight’s armor, promising a hot sausage to a blond, slingshot-wielding Austrian boy if he “hits that mustafa.” Kara Mustafa commanded the Muslim armies in the 1683 siege of Vienna—but, in today’s Austria, “mustafa” is more common as a derogatory epithet for any ethnic Turk. Perhaps it was also his sense of humor—or history—that propelled Strache to wear what he did at Yad Vashem. Instead of covering his head with a kippah as a gesture of respect at the Hall of Remembrance, where the ashes of Holocaust victims are kept, Strache wore a Biertönnchen—the red, blue, and black cap that identifies him as a lifelong member of Vandalia, a right-wing student fraternity long associated with Pan-German nationalism and anti-Semitism. Stadtkewitz, the German Freedom Party founder who was also part of the tour, says Strache was playing to Austrian TV cameras along for the ride. “It was a way for him to tell his followers, ‘Hey, look, this isn’t what it looks like,’?” he says. Although the intent of the trip was to forge bonds, some friendships weren’t made in the Holy Land. Stadtkewitz, who founded his Freedom Party in October after he got kicked out of the mainstream Christian Democrats for inviting Geert Wilders to give a speech in Berlin, says he thought his Austrian and Belgian travelmates took a step too far to the right. The ‘only democracy in the Middle East’ recently took another step towards become a police state when it recently outlawed support for the Boycott in the country itself. This effectively criminalises free speech. If you advocate the boycott of Israeli goods, not just from Israel but the Occupied Territories themselves, then you are liable to be sued by those for who might be affected. You are not liable to prove damage for loss which raises the intriguing query as to how loss is to be assessed. It is a fundamental principle of all common law systems that if you sue then you sue on quantifiable loss. But there has been a massive reaction, even inside Israel to this further attack on free speech. This is because, in the attack on Arabs and anti-zionists, the Israeli lawmakers are gradually infringing on the traditionally held belief that whatever you do to the Arabs Jews are in a different position altogether. In the New York Times, Ahmad Tibi, an Arab member of the Israeli Knesset and Hadash (communist party front) openly defied the law and spoke out in favour of a boycott (only of the settlements) in an article in the NYT. The New York Times, which used to be a byword for uncritical articles about Israel and a refusal to carry anything in the slightest favourable to the Palestinians seems to have begun changing. At one time, up to and just beyond the 2nd world war, under Jewish owner, Arthur Sulzberger, the NYT coverage was anti-Zionist or non-Zionist. A boycott of advertisers changed its mind. Today it has begun questioning Israel’s status as a democracy as in its Editorial ‘Not Befitting a Democracy’. This isn’t of course an anti-Zionist tract but it raises questions that were never before heard in the NYT. A version of this editorial appeared in print on July 18, 2011, on page A18 of the New York edition with the headline: Not Befitting a Democracy: A worrying new law in Israel chips away at free speech and political rights. Israeli officials will not throw me in jail for publicly supporting such boycotts, but settler groups can claim financial damages without even having to show any harm done. Furthermore, organizations supporting boycotts could be denied tax-deductible contributions and state funding. This week, I appealed the law to the high court. Already, a member of the Knesset, our Parliament, Alex Miller, has threatened to sue me for my words — specifically my call, which I continue to make today, to boycott the illegal Jewish settlement of Ariel. Such a call would be unremarkable in a proper democracy with untrammeled free speech. The right to criticize a population that has dispossessed Palestinians and discriminated against us for decades should be protected speech. even as Israel, a key American ally that bills itself as “the only democracy in the Middle East,” strays into undemocratic and clearly bigoted lawmaking. a political victory. Through this legislation, Israel has drawn further attention to its violent occupation of Palestinian territory and routine violations of international law. Colonizing settlers and their elected representatives now rule Israel’s political landscape, and few dare to stand against them. This reticence in the face of repeated abuses by settlers reflects poorly on Israeli society and the U.S. government. Israel is not going to change on its own. Only very real international pressure will force the Israeli government to change. Until then, we can expect more discriminatory and undemocratic legislation from this Knesset. Ahmad Tibi, an Arab Israeli, is deputy speaker of the Israeli Parliament. In light of their actions regarding the Boycott Law, Knesset Speaker Reuven Rivlin has been revealed as Israel's honorary president; Shimon Peres, as its shameful one. In the summer of 2000, half the country (including this writer) wept over Shimon Peres' loss to Moshe Katsav in the presidential election. In the summer of 2007, Reuven Rivlin wept over his loss to Peres. In the summer of 2011, it seems that Rivlin, now Knesset speaker, has taken on the role that should have been Peres'. On Friday, Rivlin published a courageous article in Haaretz against the Boycott Law, while President Peres mumbled something about "waiting for the High Court to decide." Rivlin has been revealed as Israel's honorary president; Peres, as its shameful one. The man from the right wing dared do what the man supposedly from the left did not. In the test of courage and honesty, the highest test of any elected official, Rivlin defeated Peres by a resounding knock-out. Peres and Rivlin both hold high office. Both must be "statesmanlike" and "unifying"; both can hide behind that attitude and take no controversial stand. Peres has held fast to it and says nothing; Rivlin, straightforward and brave, is prepared to speak his peace at almost any price. Peres is more beloved and admired than Rivlin, but the highest praise should go to the speaker of the Knesset. Rivlin will pay the price for his sharply worded article. The Likud man who writes about the shameful law his party initiated, "woe betide the Jewish democratic state that turns freedom of expression into a civil offense," and, "I stand ashamed and mortified before my mentor, Jabotinsky," will pay the price at the polls in the primary. That did not deter him. Peres, who has far less to lose - neither a primary nor the Likud Central Committee - preferred to curl up in his silence, or, as some would say, his cowardice. It is not difficult to guess what Peres thinks about this anti-democratic means of silencing people. One does not have to be a Peres-ologist to know what he will yet say behind tightly closed doors about this insane piece of legislation. But his heart is, as usual, just as tightly closed. Such remarks therefore have no significance at all. Peres is judged only by what he says publicly, and his public remarks are empty, despite all the "presidential conferences." A president must indeed be above the people. He must not intervene in every single controversy. But the debate over the Boycott Law is not just any controversy. It has to do with the future of government and society in Israel. A president who has nothing to say about that is not a president. A president who is silent under such circumstances is collaborating with the bullies of the right-wing. If there is one law about which a president must, absolutely must, speak up, it is this one. If there is one matter over which he must not remain silent, it is this one. If Peres still has a role left it is to try to stop the destruction of democracy. This is not even a fight for peace and against the occupation, about which Peres also whispers behind closed doors. This is the core of cores. 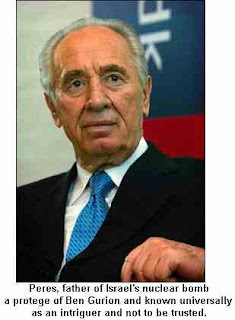 But Peres is waiting for the High Court to decide. Perhaps there, the courage will be found that he lacks. Rivlin is ashamed before his mentor, Jabotinsky; Peres should be much more ashamed before his mentor, Ben-Gurion. And definitely, publicly so. In the winter of his life, Peres has become a walking legend. We may be happy for him. I saw him on Thursday at a reception in honor of Bastille Day at the home of the French ambassador to Israel, Christof Bigo; Peres was gracious as usual, eliciting waves of empathy and laughter, amazingly vital, flirting charmingly with his translator. But that is not enough; certainly not in these dark days. It is precisely this later Peres, the beloved and the admired, who has endured so much shame and and humiliation in the past, precisely this Peres, who can finally emerge from his cowardice and speak his peace about what the right wing is doing to this country, which he helped establish. But no, Peres remains Peres: lofty in the office of president, he leaves this fateful work to Rivlin and the High Court, so as not, perish the thought, to anger MK Zeev Elkin, initiator of the Boycott Law. How did Rivlin put it? Woe betide us. They come thick and fast the revelations about tie ups between fascists and far-right racists in Europe and senior Israeli politicians. First we had an Israeli Deputy Minister Ayoob Kara breaking bread with a German neo- Patrik Brinkmann then came Anders Breivik, mass murder of socialist youth and anti-Muslim racist come neo-Nazi than we learn of his 1500 page manifesto, which is full of his love for Israel. A love which has not been unrequited, it has to be said. Breivik is acknowledged as having had close links with the EDL. He he says he had 600 EDL friends on Facebook. He claimed that Paul Ray, founder of the EDL, is his mentor, something Ray has since admitted , and likewise Alan Lake, a millionaire funder of the EDL, is likewise claimed as his mentor and ‘perfect knight’ according to another EDL supporter. .
26. It's stupid and evil not to desire death for those who call to boycott Israel. 41. Hitler Youth members killed in the bombing of Germany were also innocent. Let us all cry about the terrible evil bombardment carried out by the Allies… We have a bunch of haters of Israel meeting in a country that hates Israel in a conference that endorses the boycott.. So it's not okay, not nice, really a tragedy for families, and we condemn the act itself, but to cry about it? Come on. We Jews are not Christians. In the Jewish religion there is no obligation to love or mourn for the enemy. "One could not ignore the fact that many Israelis did not entirely dismiss the Norwegian murderer's affinity for Israel." I took an ordinary commercial flight from Bergen to Oslo about a year ago. A moment before the doors closed, a young man with a plastic earpiece boarded the plane. He was followed by two women; the younger one helped the older one place her bags in the luggage compartment. They sat in the first row - the older woman took the window seat, and the young man sat in the aisle seat. I was sitting in the row behind them. Before takeoff, the captain said, in Norwegian and English: "Your Majesty, ladies and gentlemen, good morning and welcome aboard." The passenger sitting next to me explained that Her Majesty Queen Sonja, wife of King Harald V, was the elderly woman sitting in front of us. During the flight she was given coffee in a paper cup, just like the other passengers. When we landed she took her own luggage, disembarked and headed for a green Cadillac waiting by the side of the plane. She placed her bag in the car trunk, got in the car and was driven away. This reminded me of a long-ago era in Israel when President Yitzhak Ben-Zvi would stroll Jerusalem's streets accompanied by just one policeman. Norway certainly won't be the same in the wake of the Utoya island massacre, but contrary to the assessment repeated in the Israeli media this week, there is no guarantee the Norwegians will now "identify with Israel as a country plagued by terrorism." A few hours before Anders Behring Breivik entered the Labor Party youth camp and murdered some 70 campers, some of them were waving signs demanding a boycott of Israel. As an enemy of Islam, Breivik considers himself a friend of Israel. Hatred of Muslims has been flourishing on European neo-Nazi websites, which are popular in Norway as well. The place where Norway's World War II-era, pro-Nazi Prime Minister Vidkun Quisling was executed is unmarked so that it cannot become a pilgrimage site. The call to boycott Israel by the Norwegian Labor Party's younger generation does not necessarily reflect the political sophistication of their education at Utoya. Yet it is hard to decide which is more embarrassing: the fact that Israel has turned itself into a universal symbol of evil, or that people like Breivik and various fundamentalist Christians - racist and often anti-Semitic - associate Israel with Divine grace. Shamefully enough, there are Kahane-style websites no less racist than Breivik's, written in Hebrew. True, they are often written by fanatic Americans in garbled Hebrew and draw no more than a few thousand hits. But those following the reader comments on Yedioth Ahronoth's online news site Ynet this week could not ignore the fact that many Israelis did not entirely dismiss the Norwegian murderer's affinity for Israel; many, like him, are worried about the Muslim presence in Europe. "Actually he has something there," wrote one commentator from Herzliya. Another wrote: "The ideas are good. Too bad he implemented them the way he did." Which brings us back to history. Islam gave Europe a good deal of enlightenment and cultural riches, but today's racism looks back not to that golden era, but rather to the dark ages of the Crusades. Breivik's website is full of portraits of Crusaders, their eyes lit with zealous belief. Apparently Breivik particularly admired England's Richard the Lionheart; paradoxically, he may have identified Israel with the Crusaders' Kingdom of Jerusalem. Muslim historians share this view, though they consider it a source of hope that Israel, like the Crusaders' Kingdom, shall not endure. 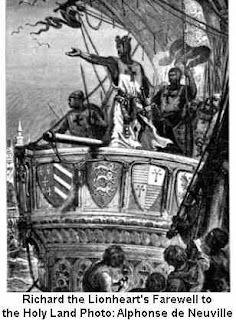 In the time of Richard I, violent pogroms against Jews rocked England; the Crusaders' passion swept through Europe and led to the murder of thousands of Jews in other countries, too. The knights of the Middle Ages fired the imagination of the Nazis, too, receiving ample space in their mythology. Breivik considered Richard the Lionheart his hero since Richard led his army to the Holy Land to liberate Jerusalem from the hands of Saladin. His soldiers conquered only Acre and Jaffa, murdering 3,000 Muslims in the process. They did not succeed in conquering Jerusalem. Richard the Lionheart now seems like quite the fool, yet England also regarded him as a hero, mostly during the Victorian era. During the reign of Queen Victoria, a bronze statue honoring Richard was erected in front of the Palace of Westminster in London, where it stands to this day. In Jerusalem, by contrast, a central thoroughfare is named after Saladin. [In fact 'The First Crusade ignited a long tradition of organized violence against Jews in European culture.' of which Richard was very much a part. BERLIN - Deputy Minister Ayoob Kara met with Swedish-German millionaire Patrik Brinkmann who has ties with German neo-Nazi groups in Berlin over the weekend, Yedioth Ahronoth reported. Brinkmann, who is trying to establish a far-right anti-Islamic party in Germany claims he is not an anti-Semite, however his previous close contacts with the German neo-Nazi party (NPD) and his past membership in another neo-Nazi party raise questions regarding his ideology. Brinkmann, 44, made his fortune in the Swedish real estate business in the 1980s before becoming mixed in tax problems in his home country. As legal battles were going on he used the majority of his finances for the establishment of two research foundations which became closely affiliated with far-right and neo-Nazi elements in Germany. One of the foundations published a study on the Nuremburg Trials examining whether justice or revenge had been achieved. 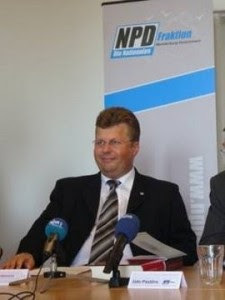 The German secret service said former senior members of the NPD and other neo-Nazis were members of another foundation created by Brinkmann. The millionaire later began supporting the Pro NRW movement, Germany's far-right and anti-Islamic party. He declared he fears that Sharia law will be introduced in the country and has pledged to establish a strong German right-wing party. He left the party last year in protest of its anti-Semitism, but resumed membership earlier this year. He now heads the party's Berlin branch. Brinkman visited Israel several months ago where he met Kara and announced his intention to promote one of his foundations in Israel. He met the deputy minister again in Berlin over the weekend as part of Kara's private visit to the city's World Culture Festival. Several months ago, Kara met with Austrian Freedom Party leader Heinz-Christian Strache who was once active in neo-Nazi groups. Meetings with such elements challenge Israel's official foreign policy. 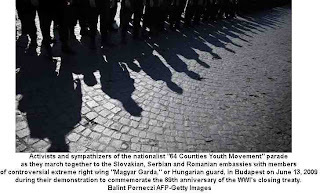 Israel's embassies in Berlin and Vienna have warned against such contacts. "Even if this is an alleged attempt to create an anti-Islamic European front, some of these elements seek to obtain an Israeli seal of approval without altering their anti-Semitic views," an Israeli state official said. Kara confirmed he had met with Brinkmann. "I know Patrik from a visit he held in Israel. I met all sorts of people at the festival with the purpose of promoting Israel's foreign relations and peace." The deputy minister said he was unaware of Brinkmann's problematic connections with Germany's neo-Nazi far-right movement, claiming this was "irrelevant." It’s hard to believe, but at the beginning of 2008 this blog was set up specifically to take up the issue of Gilad Atzmon being allowed to post on an alternative and supposedly radical alternative media/news network Indymedia. The first post on the subject, 29.1.08. was an Open Letter to Indymedia and that was followed by a number of other articles such as Indymedia finally replies to their critics. When I objected to the posting of Atzmon’s anti-Semitic rubbish masquerading as profound insights, I was surprised that some of the IM editors could not see that blaming the Jews for the holocaust and equating their ‘unpopularity’ with that of Israeli settlers might just be a tad anti-Jewish. In ‘Say No to the Hunters of Goliath’ Atzmon wrote that ‘the Jewish state and the sons of Israel are at least as unpopular in the Middle East as their grandparents were in Europe just six decades ago.’ This conflation of the victims of Nazi genocide with the actions of Israeli settler would have been obviously sick and obscene to most people with half a brain cell, but many in IM Collective seem to have totally lost their bearing. One particlar editor, Roy Bard (Free the Peeps) obstructed all efforts to get IM to clean up its act. He blocked other members of the IM collective, some of whom were very weak anyway, from doing anything, managed to confuse many people and was, of course, utterly dishonest in hiding his real reasons for his defence of Atzmon viz. that he had become part of their circle when he met Atzmon’s mentor, Israel Shamir/Jermas and many other names in Palestine. Shamir is an open holocaust denier, unlike Atzmon who tries to hide his beliefs with a thin veneer of concern for freedom of speech. Below is an interesting article by one of those involved, Geniza, looking back at the consequences of what was the most damaging split for IM. I was supported throughout not only by people like Geniza but by my late comrade and friend Steve Cohen, a unrelenting fighter against racism and Lenni Brenner, an anti-Zionist writer from New York, who has written on Nazi-Zionist collaboration. Despite the fact that Steve did not agree with Lenni and myself on many aspects of Zionism (though he moved to an anti-Zionist position in his last years) we did agree that Atzmon was an out and out racist. There have been three interesting developments in the three years since the Atzmon fiasco, and I thought it was worth an update. The first and most important change is that Indymedia UK, the coalition that runs the Indymedia UK aggregator site and newswire, is effectively being demoted by consensus of UK IMCistas. Other Indymedia collectives in the UK were increasingly unhappy with a hierarchy which implied that Indymedia UK was some sort of master-of-all-UK-Indymedia and that the Indymedia UK site did not represent the will of anyone other than the Indymedia UK collective rather than UK Indymedia as a whole. This split was of course not caused by the Atzmon fiasco, destructive as that was. However, the enormous amount of energy and time of so many Indymedia people having been utterly wasted in 2007 and 2008 simply because one or two editors at Indymedia UK were blind to Atzmon’s blatant antisemitism, cuffed themselves to the barricades, escalated the conflict at every opportunity, and smeared anyone who disagreed with them as a Zionist conspirator no matter their anti-Zionist credentials – phreeww! – was the canary in the Indymedia coal mine, showing the fault lines and reflecting in advance the deep operational divisions which soon became clear between Indymedia UK and other UK collectives. It’s famously been said that the internet considers censorship to be damage and routes around it. Indymedia in the UK is now routing around a different kind of damage. Gilad Atzmon, the anti-Semite at the center of the 2008 debacle, has continued to be more and more blatant about his antisemitism and in particular his embrace of Holocaust denial. The SWP, which used to have a page up saying, ‘We don’t always agree with him, but he’s no Holocaust denier,’ surreptitiously took the page down. Anthony Julius, among other things the solicitor who defeated David Irving, included Atzmon in his long study of the history of anti-Semitism in the UK, Trials of the Diaspora. Howard Jacobson put a former-IDF ex-pat jazz-musician anti-Zionist Holocaust denier into his Booker-winning novel The Finkler Question– although it was plainly not meant as a dig at Atzmon, since the former-IDF ex-pat jazz-musician anti-Zionist Holocaust denier plays jazz drums, not jazz saxophone, which is a completely different thing. Atzmon has however a new champion in the form of American arch-racist David Duke, former head of the Ku Klux Klan, who adores him, posts Atzmon essays on his personal site, and praises him as ‘brilliant’. 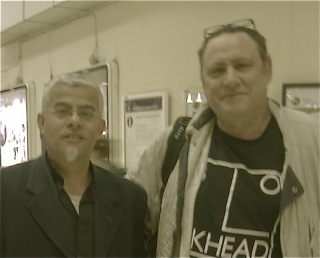 In a 2010 visit to the US, Atzmon appeared on a local-access television channel in Aspen, Colorado as part of a panel discussion. He immediately began to play his Holocaust denial cards, and the others on the panel – all of them anti-Zionists who thought they were there to talk about Israel – turned visibly green bit by bit. It’s funny to watch how decent normal human beings react when they realize they are sitting on a panel with a Holocaust denier. You can see the nausea rising. In short, in 2008 Indymedia and the SWP were the last two UK organizations not run out of someone’s garret somewhere granting Atzmon’s anti-Semitism even the slightest shred of political cover. Neither now does. It’s also become clearer just why one Indymedia editor tied himself to the barricade and refused to accede in the banning of Gilad Atzmon from Indymedia. How was it possible for him to simultaneously be so wrong, so cluefree, and yet so hardheaded about it? The answer turns out to be here. 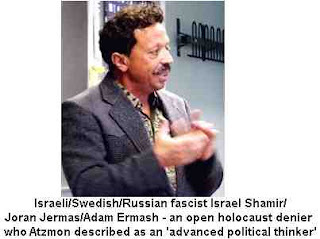 Israel Shamir hit the headlines over the past few months over his association with WikiLeaks. Say what you want about WikiLeaks – not the topic of this blog – but even the most sanguine of commentators in the press is bothered by Assange’s decision to work with Shamir. If you followed the press over the last few months, the general conclusion was that although Assange was not an antisemite himself – a few odd utterances and failed jokes aside – he was apparently a catastrophically poor judge of character, nowhere better emblemized than in his choice to work with the Holocaust denier Israel Shamir. So now we know why one of the Indymedia editors felt it was his personal duty to put Indymedia in the UK through its worst crisis to date, overriding the better judgement of nearly every IMCista in the UK. He was prepared from day one to treat the whole issue as nothing more than ‘Zionist slander’ (from people any fool could see were obviously not Zionists) and to never once stop and question himself one bit whether Atzmon and Shamir were legit, no matter how the rest of the network begged him to do so. The editor had his initial frame, erroneous from the start, and swore by his sword that no fact could ever change it even one millimeter — all inspired by someone whose raw antisemitism is now the stuff of headlines, even though the editor could never quite see it and was reduced to mumbling smears smears smears as he could formulate no other response. That’s the most disappointing part of the whole business. At the end of the day, the editor in question still doesn’t have clue one about what the discussion was even really about. His position did not change one iota from start to finish: Shamir and Atzmon are perfectly, perfectly innocent little lambs being persecuted by those mean anti-Zionist ‘crypto-Zionists’ through utterly false cries of ‘anti-Semitism!’ – and incidentally, what’s so very wrong with calling the gas chambers of Auschwitz “discredited” anyway? His position – exactly the defense offered by the mad hatters Shamir and Atzmon themselves – made no sense on day one and makes no sense now, but sometimes you have to simply stand back and let the force of implacable stupidity hold its sway. In the end it all comes out in the wash.
'I'm not a historian' he replies! You may recall that I covered the strange story of an Atzmon interview with Sammi Ibrahim of Unity FM a month ago. I was asked to wait to develop my point until after the break but I was left hanging on. Having now had a chance to listen to the recordings of the interviews on Atzmon’s own site I heard a few more things that I had missed. When Sammy asked me to call back Atzmon responded, though it was cut off immediately after that ‘If he comes back I’ll’ You can fill in the words yourself! But more interestingly I missed the questioning of Atzmon by Sami, 4:44 into the second tape, Atzmon is asked if the holocaust occurred. Does he respond with a direct answer? Of course not. If he thought it did occur he would have not problem answering but instead he resorted to saying he wasn’t a historian. Now this is really plumbing the depths, even for Atzmon. Do you have to be a historian to for example believe that there was a Nakba and that Palestinians were expelled by Israeli settlers? Or to believe in the slave trade, the murder of 10m Africans in the Belgian Congo? It is of course absurd. You don’t need to be a historian to have an opinion as Atzmon himself amply demonstrates. What this proves is that Atzmon is indeed someone for whom there is doubt about the holocaust and I would argue that it goes much further and that this is a paper thin device for holocaust denial. And when I complained about what had happened when Atzmon bottled it, I received a promise it would be looked into and then... nothing. I instead received an e-mail today saying that unless I took down my original blog article then presumably nothing would be done. I’ve amended the article to make it clear that Sammy Ibrahim does not run the station, but I have no intention of rewriting history. SI: Tony I’m coming to an advert, sorry, just one second Gilad, I’m coming to an advert. Can you call back Tony Can u call back to me tony I’m doing an advert. SI: [4:24] But my question to you is did you question the holocaust? SI: Did the holocaust take place? I don’t like this form of discourse where certain parts of our past are excluded. As you probably know, for many years, we couldn’t discuss the Nakba, it was a big struggle and to deal with this issue openly, I think we are doing very well on that front, and I think that we must be able to address major ethical and historical questions to do with world war 2. SI: What did the Palestinians do in WW2 to deserve the Nakba? Before taking this any further, I would first like for you to remove the blog you have regarding Unity FM radio station because Sami is not the person in charge of it nor does he run it. If there is something going on between you and Sami or Atzmon then please don't involve Unity FM in your disagreements. I would really appreciate it, then we can go on to the next step. I am surprised that after more than a month I have received no feedback on what happened when Atzmon was interviewed and I was barred from continuing to question him. Especially when in the 2nd session you said there were no callers when I was on the line. I know now that Atzmon threatened to walk out if he was subject to the debate he goes on so much about so I am repeating my offer - to come on to the programme and explain why anti-Semitism has no place in Palestine solidarity. Thank you for your email. I will have a look into this and deal with it accordingly, meanwhile, if there is anything else please feel free to contact us. I don't know whether anyone else tried to phone in but I did and got in briefly before being interrupted for the adverts and then wasn't brought back despite the presenter Sami's promises to do so as it was decided by Sami to turn it into an interview rather than a phone in programme. In short it was a disgraceful showcase for Atzmon's pernicious views. Like thieves in the night, Israeli special forces launched an attack against the Freedom Theatre in Jenin, whose Director Juliano-Meir Hamis was murdered earlier this year. This is not the first such attack. In May 2009 Israeli police closed the Palestinian Festival of Literature because it was ‘political’. 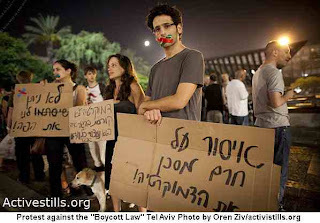 Israel’s supporters in the West froth at the mouth when mention is made of a cultural boycott. None more so than Jonathan Freedland who sees in a Boycott shades of the armed SA siege of Jewish shops in Nazi Germany on April 1 1933. However when it comes to the incessant attacks by Israeli military forces and police on Palestinian cultural phenomenon, not the peaceful picketting and persuasion of Palestinian supporters but armed physical attacks, then Freedland and others remain shtum, silent, look the other way. 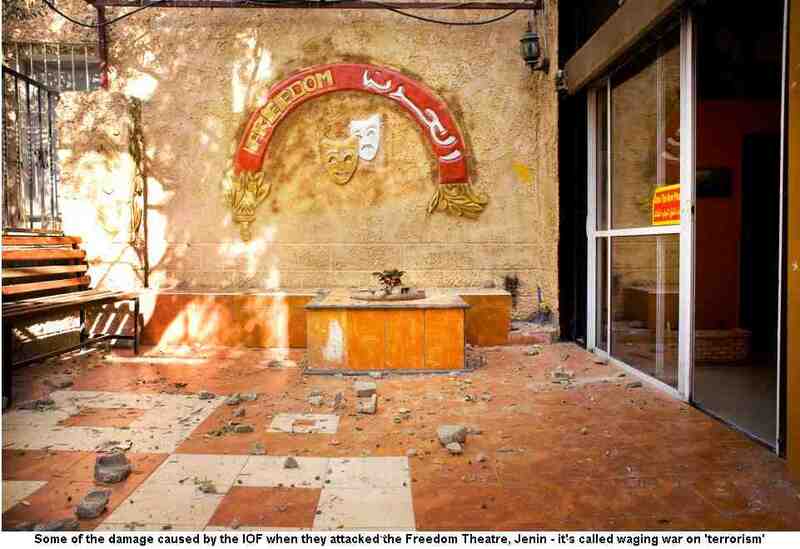 The attack last night on Jenin’s famous Freedom Theatre in the Jenin Refugee Camp is an outrage, as is the arrest of 2 of its workers. No doubt some excuse or other will be dredged up, as is normally the case when Israel justifies its most recent barbarity. They will no doubt he found to have been a ‘terrorist theatre’ ‘inciting’ the occupied Palestinians to do something they wouldn’t normally do, i.e. resist the occupation. And the Jewish Chronicle, were it to mention the above outrage, would no doubt be brimming over with special pleading. But we should take full advantage of this attack to expose the utter hypocrisy of those who oppose a Boycott of Israel and all its works. Those who launch armed attacks against the theatres and cultural festivals of an oppressed people cannot then claim that culture and politics have nothing to do with each other or even more grotesquely to claim that there is any similarity between BDS and the Nazi ‘Boycott’ in fact siege of Jews in Germany. In fact, the Nazi attitude to Jewish culture exactly mirrored that of the Israeli state today. Special forces of the Israeli army attacked the Freedom Theatre in Jenin Refugee Camp at approximately 03:30 this morning (27 July). 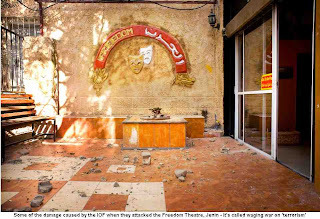 Ahmad Nasser Matahen, a night guard and technician student at the theatre, was awakened by heavy blocks of stone being hurled at the theatre by soldiers; several windows were shattered. As he opened the door he found masked and heavily armed Israeli soldiers around the theatre. The location manager of The Freedom Theatre, Adnan Naghnaghiye, was arrested and taken away to an unknown location together with Bilal Saadi, a member of the board of The Freedom Theatre. When the general manager of the theatre Jacob Gough from the UK and the co-founder of the theatre Jonatan Stanczak from Sweden arrived to the scene, they were forced at gunpoint to squat next to a family with four small children surrounded by approximately 50 heavily armed Israeli soldiers. JERUSALEM — Israeli commandos stormed a famous Palestinian theater in the West Bank early Wednesday, arresting two men associated with it and damaging the building, a witness said. 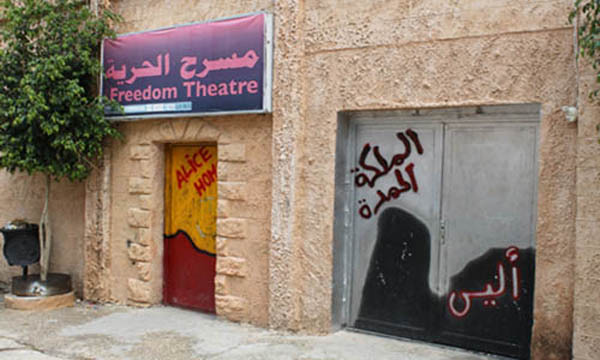 The Freedom Theater in Jenin, in the northern West Bank, had been an oasis of so-called cultural resistance for decades although it was in the news for a darker reason in April when its director, Juliano Mer Khamis, was shot dead by masked gunmen just outside it. An army spokeswoman would confirm only that two men were arrested near the theater but gave no details on why the arrests took place or whether they were related to Mr. Mer Khamis’s killing, which remains unsolved. The witness, Jacob Gough, who has been managing the theater on an interim basis, said he was called there about 3 a.m. Wednesday and saw several dozen Israeli soldiers throwing rocks at the windows and then arresting Adnan Naghnaghiye, a technician and site director for the theater. Other troops went nearby to the house of Bilal Saadi, the chairman of the theater’s board, and arrested him after destroying the windows of his house, Mr. Gough added. The soldiers, he said, ordered the two men to remove their trousers and lift their shirts. When he asked what was happening, Mr. Gough said, he was told to be quiet in harsh terms and at gunpoint. He said the men arrested were taken to separate prisons and a lawyer had been hired to work on their cases. Mr. Mer Khamis, 52, was a world-renowned actor and director who was born to an Israeli Jewish mother and a Palestinian Christian father. An Israeli citizen, he had lived for seven years in Jenin. 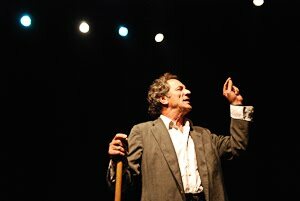 His mother, a peace activist, founded the theater. A film Mr. Mer Khamis made about her work, “Arna’s Children,” received wide international praise.